A lot going on in the political world this week... time to give a little abaum perspective. First off is the special election in newly minted NY Senator Kirsten Gillibrand's seat in the state's 20th district. This is a district whose Republican voter registration outnumbers Democrats by some 75,000 voters. In 2006, Gillibrand was the first Democrat to win the seats in many years, and Obama won the district with 54% of the vote. That said, Democratic newcomer Scott Murphy faced an uphill battle against veteran Republican assemblyman John Tedisco. Murphy, with nearly no political experience, has done a valiant effort of coming from behind, and in the final days leading up to today's special election, he took a narrow lead in the polls. This is all the more remarkable when you consider the amount of resources the Republican party has poured into this race over the last several months. The RNC and NRCC have put a lot of time, money and resources into winning this race. If Murphy wins, it will be a remarkable feat, and even if he loses, as he still might, the fact that it was so close still speaks well of the competitive advantage Democrats enjoy overall in this country, even in areas where Republicans vastly outnumber Democrats. Politico has done a nice job breaking down all the ways this race can be interpreted, but the bottom line is that win or lose, this at best is an indicator of great Democratic strength and at worst is a showing of how strong Democrats are even in District's where they are not electorally favored. At this moment, Murphy and Tedisco are separated by only 65 votes, and it may easily come down to the 5900 absentee ballots yet to be counted. We might even see a recount in this tight race. As one blogger said, "This was a remarkably high-turnout special election, and Scott Murphy's performance already is nothing short of amazing in a district where the GOP enjoys a huge registration edge." Speaking of close elections, a three judge panel has ruled dealt another setback to Norm Coleman's electoral challenge of Al Franken's narrow victory in the Minnesota Senate Race. Some in the GOP are already calling for "WWIII" if Democrats attempt to seat Franken, and Coleman vows to press on with legal challenges. While an Appeal is certain, Coleman's hopes keep getting dimmer, as we slowly get progressively closer to seating this former SNL funnyman as the 59th Democrat in the Senate. Third, President Obama (its still so great to type that!) set off for his first European tour today, where he will make several important stops, including a critical meeting of the G20 in London and what has been billed as a major speech to the Muslim world in Turkey. Along the way, we'll have the delightful diversion of watching the First Lady wow the world with her charm and stellar fashion sense - the internet was already buzzing today with talk of her outfit transformation entering and exiting Air Force One. Comparisons to the Kennedy's are being called "inevitable" as this young, energetic couple sets out to repair the damage to America's reputation on the World stage. Finally, here's a hard hitting ad from the DSCC targeting vulnerable Republican senators up in 2012. Arlen Specter, watch out! I don't normally post a lot of pop-culture related items, but this I couldn't resist. "Where the Wild Things Are," Maurice Sendak's famous children's book, has been made into a movie by Spike Jonze, and was partially written by Dave Eggers. My expectations are high, as I have always held a special loving place for this book in my heart. I think the trailer looks sweet... check it out! DKos has a detailed discussion of the coming reports detailing "the "enhanced" interrogation techniques approved by the Bush administration for use against "high value" Qaeda detainees. The memos, written by Justice Department lawyers in May 2005, provide the legal rationale for waterboarding, head slapping and other rough tactics used by the CIA. One senior Obama official, who like others interviewed for this story requested anonymity because of the issue's sensitivity, said the memos were "ugly" and could embarrass the CIA. Other officials predicted they would fuel demands for a "truth commission" on torture. Because of an executive order signed by President Obama on Jan. 22 banning such aggressive tactics, deputies to Attorney General Eric Holder Jr. concluded there was no longer any reason to keep the interrogation memos classified. But current and former intel officials pushed back, arguing that any public release might still compromise "sources and methods." According to the administration official, ex-CIA director Michael Hayden was "furious" about the prospect of disclosure and tried to intervene directly with Obama officials. But the White House has sided with Holder." Check out more analysis here. This morning I awoke to breaking news that my Congresswoman, Debbie Wasserman Schultz (D-FL) has secretly been battling cancer over the last year. "The Broward County Democrat and mother of three told The Miami Herald on Saturday that she successfully battled breast cancer for the past year and is going public with her story in the hope of alerting young women to its prevalence. She'll introduce legislation Monday that calls for a national education campaign targeting women between 15 and 39. In the past year, she underwent seven major surgeries, including a double mastectomy and reconstructive surgery, while balancing motherhood, Congress and her roles as a chief fundraiser for House Democrats and a political surrogate, first for Hillary Clinton and then for Barack Obama." Having worked for the Congresswoman in the summer of 2007, I can tell you that she is in private everything she is in public: energetic, passionate, and a forceful advocate for the Democratic agenda in Congress. The fact that she has been able to fight off this cancer battle while continuing to maintain her very public persona is an extraordinary testament to the vitality and drive of this inspiring woman. As I learned of her cancer battle today, I thought of the reception I saw her at only months ago in Washington the weekend of the Presidential Inauguration, and how hard she was working the room, making time to engage every constituent who wanted a moment of her attention. It is hard to believe that she was up and working like that only weeks after such major surgery. Debbie Wasserman Schultz is really a remarkable person whose strength of character should be an inspiration to us all. May God bless her with good health and good fortune as she continues her work on the behalf of her constituents and the people of the United States. It is so exciting to have a president that not only supports national service, but is taking big, bold action and spending political capital to expand and strengthen the service movement for generations to come. In last weeks Time Magazine, President Obama wrote an editorial calling for a New Era of Service. In it, he describes his own experience with service, and explains why service is so essential for our country. The GIVE Act, the service bill in the House, passed by a more than 3 to 1 margin this week. Now it is time for the Senate to act so we can get the national service legislation on the president's desk. We need you to help make sure that the Senate passes the companion Serve America Act when it comes to a vote early next week. Please call your Senators right away to ask them to support this crucial bill. If we can help get the Serve America Act passed, President Obama will soon sign historic legislation and make a huge downpayment on his pledge to make service “a cause of my presidency.” Please take a moment to support this critical legislation today. Several weeks ago, the Penn Program on Regulation sponsored a presentation at Wharton Business School entitled “Climate Change: Nature and Action” that I want to recommend everyone take a close look at to get a more sophisticated understanding of the serious ecological and biological disasters we face as a planet due to ongoing climate change - impacts that, if not mitigated immediately, will have devastating consequences for our and future generations. The presentation was made by Thomas Lovejoy, an influential biologist who is currently President of The H. John Heinz III Center for Science, Economics, and the Environment in Washington, DC. Lovejoy presented evidence that the current climate change challenge is best understood in terms of the normal and historical functioning of the Earth system. Human activity has caused and is increasingly causing a major distortion in that system, with major consequences for the living planet and human well-being. Change is ubiquitous in the living fabric of the planet, signaling the need for dramatic and immediate action. There is a need to transform the energy base for society as well as to engage the living planet in removing some of the excess carbon in the atmosphere. The "energy approach" (reducing emissions of greenhouse gases) and the "ecosystem approach" (restoring degraded lands to increase CO2 uptake) are both important and complementary, and we must urge the Obama Administration and the Congress to take specific actions to further both strategy's immediately. The powerpoint slides from the presentation, as well as a video of the presentation itself, are available here. I highly recommend taking a closer look at this research if you are interested in a highly scientific and detailed analysis of what climate change is already doing and will continue doing to harm our planet. This Wednesday, March 18th, Congress will vote on a critical bill that will have enormous consequences for the future of National Service in America. The GIVE Act, HR 1388, is the boldest service legislation in over 70 years. It proposes to expand AmeriCorps from 75,000 to 250,000 annual slots, more service and service-learning for students, new opportunities for older Americans to serve, and more. You can read a summary of the bill here. We need your help to make sure this bill passes with bi-partisan support. Please take a moment on Tuesday to contact your congressperson and let them know how important National Service is to you, and urge them to vote for this bill. Details follow below. We have also launched a petition to demonstrate to Congress the broad support for service as a strategy to help solve our challenges and a way to create jobs. In addition to your personal calls, this is another simple way to show our leaders that service should be a priority to help get our nation back on track. You can read more about the politics of this Act, and why it enjoys bipartisan support, in this great article by EJ Dionne in the Washington Post. Thank you for taking a moment out of your day to support this essential legislation! 1. If you need help determining who represents your district visit www.congress.org. 2. Call the House Operator at (202) 225-3121 and ask to be connected to the office of your representative. 3. Once connected, identify yourself as a constituent and ask to speak to the Legislative Assistant in charge of national service and education issues. I am calling to ask Representative _______ to vote for the GIVE Act (H.R. 1388). The GIVE Act will reauthorize the federally-supported national service programs like AmeriCorps, Learn and Serve America, and Senior Corps, which have not been reauthorized in 16 years. The reforms in this bill will ensure accountability, transparency, and results. They will also make it easier for faith and community-based organizations, including small nonprofits in rural and economically disadvantaged areas meet growing needs in a more effective way. The GIVE Act will help the nonprofit sector to engage our citizens in addressing local and national challenges in education, health, clean energy, poverty and many other areas. The federal investment is leveraged by significant investment from the private sector and philanthropy. This is a bipartisan bill. It is not controversial and the White House supports the legislation. I hope that Representative______ will vote in favor of the GIVE Act. This article from the Independent is more confirmation of what I have been saying for years - that climate change is not only real, but quickly become inescapably and irreversibly devastating for the future of our planet. Even if we do act quickly, as we must, there is still only a 50/50 we will not see temperatures higher by more than 2 degrees by 2100, enough to cause catastrophic destruction to our planets ecosystems and our human way of life. The time for action on climate change is not now, it is yesterday. We must boldly act or face dire consequences. Last night I had the most incredible dream that I have to share with you all. I pulled into a parking lot in Israel and got out of the car. Across the lot, I could see my great aunt, Mashita, standing up by another car. I rushed over to greet her. As I came close, I saw the back door of the car was open, and inside my grandmother, Baba Sofi, was sitting. Baba is in a wheelchair now and can't walk, but I wrapped my arms around her and lifted her up out of the car, and she stood up beside me! Then I got into the back seat of the car. In the driver's seat in front sat my Great Grandmother Malka, (we call her 'Little Abuela') who passed away when I was 18. We were extremely close when she was alive, and everyday I wear the star of David she gave me as a gift when I was nine years old. She looked beautiful. Her face was no longer lined with the wrinkles of age, but was smooth. She looked young, maybe in her 50s. I wrapped my arms around her and kissed her on the cheeks and exclaimed how excited I was to see her! "I miss you so much," I said. She smiled and said, "Because I am always with you." At that moment, I opened my eyes, and found myself back in my bedroom in Philadelphia. I sat in the darkness with a sense of wonder. I felt, not like I had just had a dream about my great-grandmother, but as if I had actually just been with her. I had an overwhelming sense of her presence, as if her spirit actually came to me in my sleep to remind me how much she loves me. As I got up to use the bathroom, I clutched the Star of David around my neck in my hands and reminded myself of her words: "I am always with you." I have been on a kind of spiritual high the whole day. One of the more exciting things I have had the opportunity to do this semester is plan my first event for the American Constitution Society (I am on the board as a 1L Representative.) I posted a video yesterday about the event we recently held on bloggers and the new Administration. This next event promises to be even more explosive. 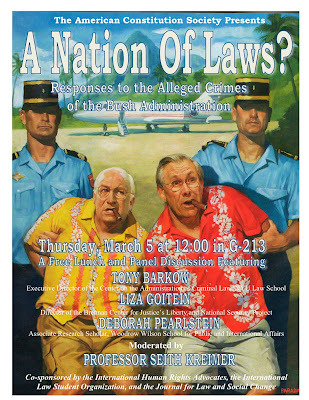 Featuring three pre-eminent leaders and scholars in the fields of criminal and constitutional law, as well as human and civil rights, and moderated by my Constitutional Law professor (and all around genius) Seth Kreimer, it is going to be a revealing discussion about the legal response to the abuses of executive power done by the Bush Admin. I am posting the event flyer here on the blog. If you're in Philly next Thursday, take a lunch break and come on over for this great panel. You won't be disappointed.